My latest project is for a coworker who is due to have a baby in October. I’m surprised that I’ve worked with a few novelty yarns in the past year or so. 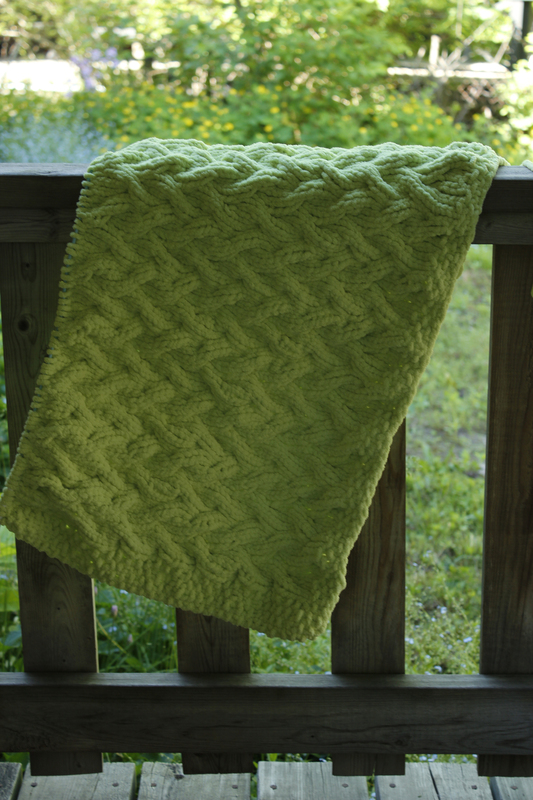 I’ve always been a bit of yarn snob, but I have to say Bernat’s Baby Blanket yarn is lovely. It’s thick, warm and soft. And comes in lots of great colours so you aren’t stuck with the typical blue, pink or yellow yarn generally offered for baby yarns. Hi, I just started this blanket and I have definitely having the problem right at the outset. I’ve cast on and seed stitched the first 4 rows. I have the required 72 stitches. Then the pattern said seed stitch the first four stitches “Knit 4, M1 and repeat to the last 4 stitches ending with 88 stitches. Well I started out with 72. 8 stitches are not in the knit 4, m1 part so that leaves 64 stitches to work that sequence over. I’ve drawn it out and it has room for only 12 make 1’s. That is only 84 stitches. What am I missing? Any help you could provide is greatly appreciated. Sorry but I haven’t knit this pattern in over three years. Also I wasn’t sure if you thought this was my pattern but it’s not. I didn’t design it. I don’t recall having any problems with the pattern. Perhaps you could find an answer on the Bernat website? Sorry I can’t help you out much more than that. BTW, this is for the Shadow Cable Baby Blanket pattern.